It is very quiet in Sin City, No murdres this month which is always good. So far this year 25 westerners have died, this pails into significance compared to Thai fatalities. So far this year there have been 77 murdered Thai people. Just keep away from pissed up Thai blokes with guns and grudges. 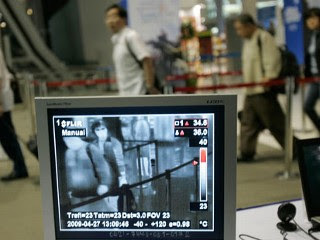 Thermal camara at BKK Airport looking for people with a high temperature. 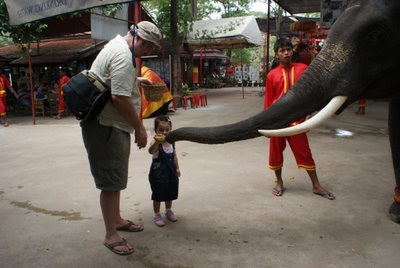 Thailand as been hit by an out break of the swine flu virus. within one week the numbers suffering have gone from a couple up to over 400. The largest outbreak is in Bangkok and mostly amongst school children, there are only 12 people hospitalised, but the authorities are worried about the quick numbers involved. Pattaya as had several dozen infections and the Pattaya One news channel had this report the other night. Following the disheartening news that 24 people living and working in Pattaya have succumbed to the popularly-known swine flu virus, our journalists took to the darkened streets on Friday night to see how the nightlife of the city was bearing up. It wasn’t. Friday night is usually a pretty busy time for most night entertainment venues but places like X-Zyte Disco on Third Road and the smaller karaoke joints, also along Third Road, were devoid of custom. Some hotels reported they had very few rooms occupied with revelers and traffic on the streets in and around the city was light. While it is low season at this time of year anyway it does appear as though many people are staying away from the streets of Pattaya." This is yet another bad news day for Thailand. Ilearned today that I have a new job, before I reveal where it is I have to go yo a meeting next tuesday to cross the T's and dot the I's. It will be a formality. The job is in the erecting of steel buildings, mainly agricultural. I'll probably be away from home for some time, but the money is good. 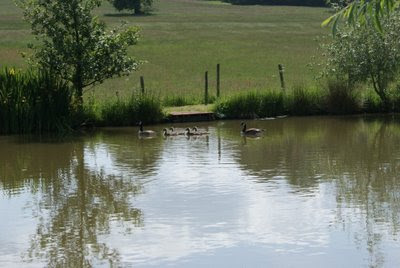 What a lovely weekend that was, temperatures around 25C and no rain. 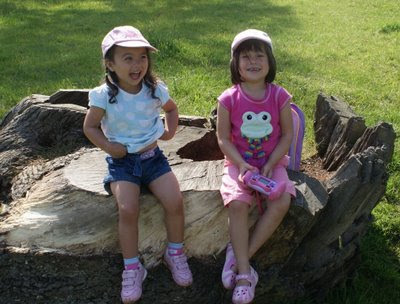 Elizabeth and I went for a walk yesterday with Emily and her dad. 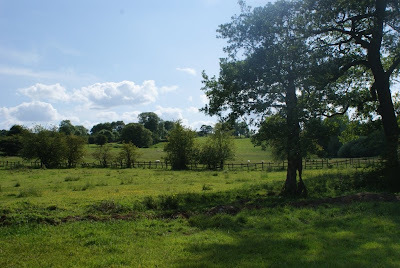 I took advantage of the weather to ake a few more pics with my new camara, so below are some of the pictures I took. Lots of cudos points if anyone can guess where there were taken. Wot! Lost my F****** job again!!!!!! Went to work tonight only to be told that production had been stopped! The whole world is in the middle of a global turn down, we see it on TV everyday. I myself have been made redundent as a direct result of the credit crunch. Smaller world, more places for tourists to visit. 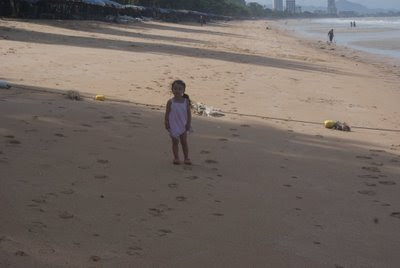 You can see from the picture of Elizabeth on the Jomtien beach at 11am that things are very quiet in the resorts. The two hotels we stayed were both at under 20% occupancy. Thailand can't keep this going for long, this is low season, but it is turning in a "No season". 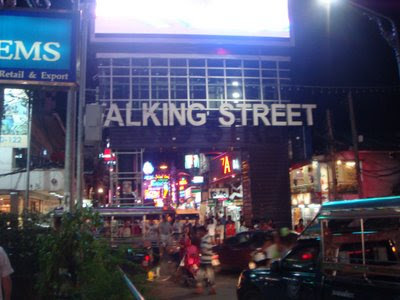 In Pattaya, Walking Street was busy, but not packed and the go go bar areas were not very busy, alot of girls just lounging about waiting for any client to come in. I hope it picks up, but I think the down turn will continue. On the bright side for me it will make it cheaper for us to go away again. Pattaya as created a new floating market, whilst its very touristy, it was a good morning out. Set in a man made lake there are about 100 stores on stilts connected by wooden plank walk ways. There are also vendors going round in traditional canoes trying to make the whole thing look authentic. It is a good day out and there are bargains to be had. 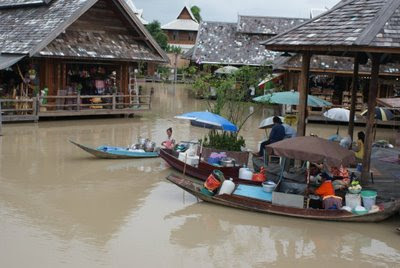 Make time if you are in Pattaya to go the floating market. 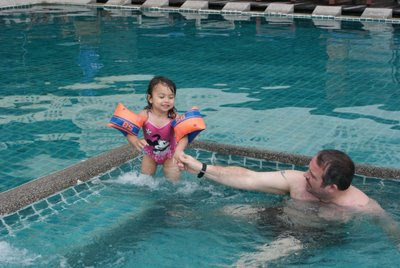 Near the end of our second week in Thailand we travelled to Pattaya for an over night stay. 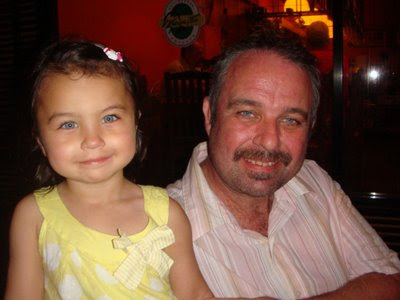 Nuch's parents came along to spend more time with Elizabeth. 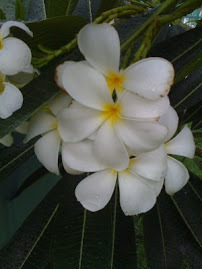 Pattaya, more commonly known as "Sin City" is in low season, but i'll talk about that later. We stayed at Jomtian Thani Hotel on Jomtian beach, we were a little dissappointed with the Hotel, but this was unfair being as our last Hotel was a Dusit Thani resort hotel and four times more expensive. Once we settled in it was straight down to the pool. Elizabeth loves swimming and the pool was very good. 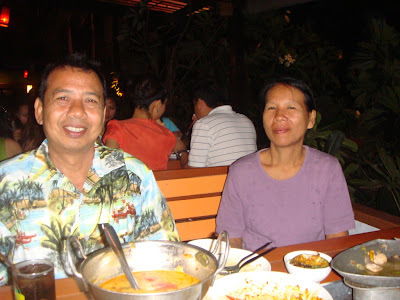 In the evening we went to the end of Jomtien beach to a new sea food restaurant, Nuch and her parents loved it, i'm not a seafood fan, but the restaurant was clean and the food looked great. Later Nuch and I went to my favourite Mexican restaurant in Thailand and I had a great Chicken Fajitas and few more beers. A quick breakfast and swim in the morning we were on our way back to BKK, I would have liked another day on the coast but it was not to be. I've heard of the Double Big Mac but never came across one. On this holiday I finally had a double Big Mac, one bun with four patties on it. Half a pound of meat. It should be nice, but in reality they were hard to pick up and the whole thind disintigrated half way through. Too much meat, too much fat. Not as nice as you might think. Today we payed a visit to the old capital of Thailand, Auyittaya. 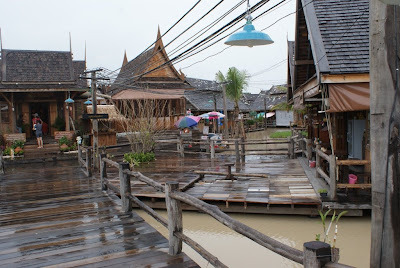 Set about 100 km north of Bangkok this is a very city with lots of ruins and a traditional thai sort of way of life. I could best describe this as an equivalent to York in the UK. 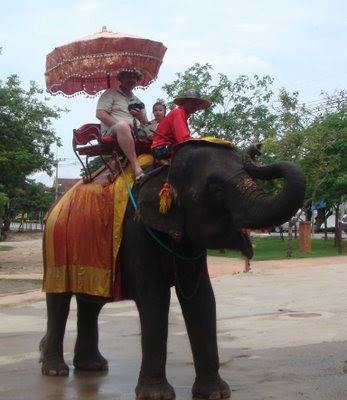 We went to see the big Buddha temple and had a ride on the elephants which Elizabeth loved, she fed banana's too one. Even these Asian elephants are massive when you are up close, the power they pocess is amazing. The was also the hottest we have come up against, bloody hot in fact!! !